A visit to Sleepy Hollow Cemetery in Westchester County, New York evokes more than the history of its most famous inhabitant. Founded in 1849, Sleepy Hollow Cemetery is located in New York’s Hudson Valley, just north of New York City. A notable example of the rural cemetery movement, it is nestled in a small village that was previously called North Tarrytown until its residents elected to change its name to Sleepy Hollow in 1996. The townies hoped to benefit economically from the area’s rich historical ties to The Legend of Sleepy Hollow, one of the most fabled ghost stories and earliest pieces of American fiction. That change has, in fact, increased tourism to the cemetery and the region in general. The cemetery is adjacent to the Old Dutch Church (built circa 1685), whose burying ground is said to be inhabited by the ghost of Irving’s Headless Horseman. The tombstone of Washington Irving, who wrote both The Legend of Sleepy Hollow and Rip Van Winkle, is the most visited grave in the cemetery. Tourists come from all over the world to pay their respects to the man who is said to have been the first American author to support himself professionally as a writer. Irving’s modest marble tombstone sits in a crowded family plot on a hill behind a cast iron gate with his family name written on it. We learned that this is actually the third (and hopefully final) iteration of his gravestone. Souvenir hunters chipped away at previous ones, which eventually had to be replaced. While neighboring gravestones have turned gray with age, the Sleepy Hollow Historic Fund’s Washington Irving Restoration Project tends this one keeping it white. We also learned that while older tombstones were fashioned of marble at this and other cemeteries, more recent ones are made of granite, a far more durable stone. Several mausoleums are noteworthy because they memorialize titans of industry. Built in 1920, the stately granite mausoleum of William Avery Rockefeller (1841-1922), brother of John D. Rockefeller, is the largest in the cemetery. Rockefeller was a partner with his brother in Standard Oil and later went on to become a copper magnate. While the mausoleum was being built over more than a year, before the days of refrigeration, Rockefeller’s body was kept in an underground receiving vault that still sits on the cemetery grounds. Although the vault’s identifying plate is marked 1900, it is thought to have been there for at least 50 years before that. Several scenes from the 1970 horror movie House of Dark Shadows were filmed outside the vault. Another iconic mausoleum is that of Walter Percy Chrysler (1875-1935), a name synonymous with the growth of the American automobile industry as well as the construction of the art deco Chrysler Building in Manhattan. In the same section of the cemetery, the dome-shaped John Dustin Archbold (1848-1916) mausoleum was built to memorialize this businessman, once a competitor who later collaborated with John D. Rockefeller. The beautiful bronze door is designed in an Eastern motif with a mosaic overhead. The most infamous mausoleum at the cemetery belongs to Leona Helmsley. This is the backstory: A community mausoleum was being constructed near the grave of her husband Harry, who was buried at Woodlawn Cemetery. When the new construction threatened to compromise its views, she had his body exhumed and moved to Sleepy Hollow Cemetery. The “Queen of Mean” now reposes here with her husband in a very tasteful structure that faces the Pocantico River. I never knew a day I did not love you. 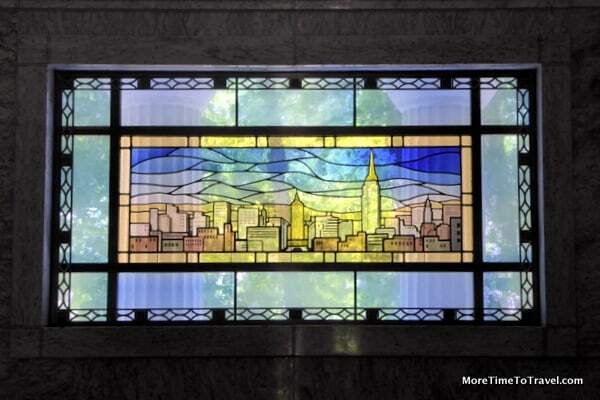 On three sides of the mausoleum, stained glass windows display images of the New York City skyline. Other notable graves include those of philanthropist Andrew Carnegie; Elizabeth Arden, who built a cosmetic empire; Samuel Gompers, one of the forces behind the American Federation of Labor; philanthropist Brooke Astor; and minister and author Henry Sloane Coffin, who taught at the Union Theological Seminary. The cemetery is listed on the Register of National Historic Places and showcases monuments to both the Revolutionary and Civil Wars. Its grounds are as serene as they are beautiful—with sculptures, mature trees, and plantings that change colors with the seasons. Although not all the roads are paved, you can either walk or drive through the cemetery while following a self-guided tour. The cemetery offers a number of fascinating walking tours led by trained docents, some of which are held in the evening with kerosene lanterns. Of course, the most popular season for tourists is in the fall, especially around Halloween. Sleepy Hollow is still an active cemetery (as opposed to one that is closed to new burials). It also offers the opportunity for visitors to see a more contemporary-style community mausoleum, and is one of a small group of burial places offering “green” burials that use only untreated biodegradable, natural materials for caskets or shrouds. The cemetery is accessible from Manhattan via Metro North’s Hudson Line to the Tarrytown station. Free maps are available at the cemetery office. You can purchase an expanded color version with descriptions of significant monuments for $5. Check opening hours and holiday closures before leaving home. The cemetery is located just a few miles from Sunnyside, Washington Irving’s Home, New York and Kykuit, the Rockefeller Estate in Pocantico Hills. When visiting any cemetery, wear decent walking shoes to avoid tripping on rocks or exposed tree roots and always be respectful of the setting. I went to visit Sleepy Hollow Cemetery in 2014. I had just paid a visit to Sunnyside, Washington Irving’s home not far from there. It’s a beautiful place. Did you go inside the church? I’m not sure if it is ever open to the public? Beautiful cemetery! Another amazing one is Hollywood Forever Cemetery. Thanks, Irene. I will go to the link and read your article now !